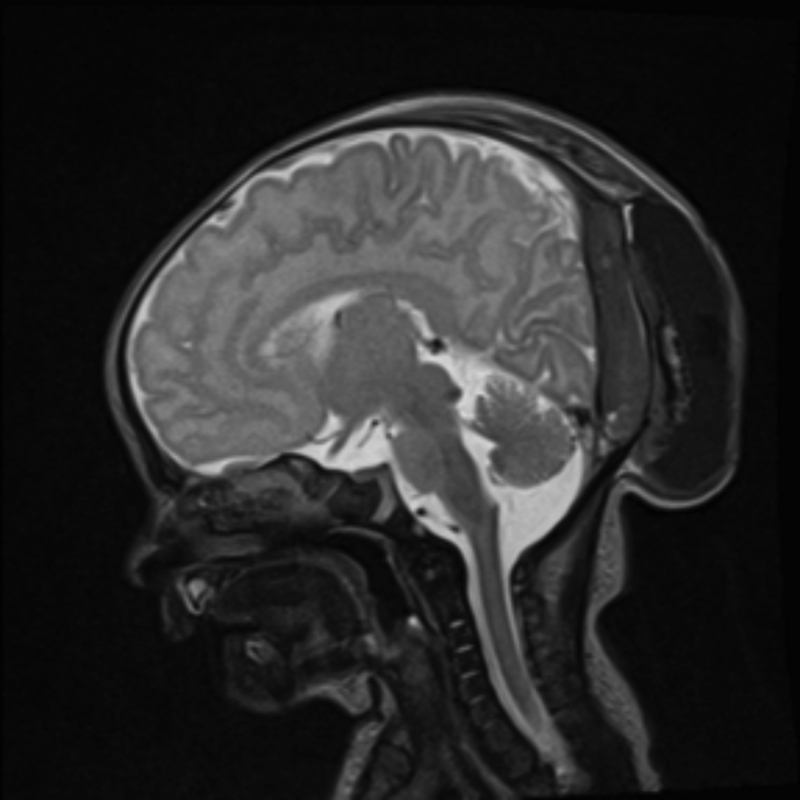 A male neonate presented at birth with a subcutaneous mass in the parieto-occipital region. He had an unremarkable birth history. Brain MR imaging at 4 days’ old revealed a large mass. The mass was resected. The mass was identified as dural-based malignant melanoma in the parieto-occipital region. The lesion extended between the sutures into subcutaneous tissue. The tissue was red-brown with scattered cytoplasmic pigment and extracellular pigment accumulation. Neoplastic cells were positive for S100, HMB-45, and vimentin. The BRAF mutation was not detected. The patient developed numerous hyperpigmented 2- to 3-mm nodular lesions, which were histopathologically identified as malignant melanoma. After resection, the patient began chemotherapy at 3 mo old. Postoperative brain MRI and CT demonstrated no evidence of intracranial mass, hemorrhage, or hydrocephalus. PET/CT revealed no evidence of metastases. The postoperative midline occipital defect was repaired with cranioplasty. He has met all developmental milestones with no residual neurological deficits. Brain MRI demonstrates a mass with intracranial T1 hyperintensity/T2 hypointensity and extracranial heterogenous T1 hyperintensity/T2 hypointensity with mass effect on the patent superior sagittal sinus and brain parenchyma (Figures 1,2). Computed tomography demonstrates posterior cortical irregularity with posterior scalp edema (Figure 3). This case demonstrates congenital malignant melanoma of the dura mater with extracranial extension through the occipital bone. Magnetic resonance imaging (MRI) revealed mostly T1 hyperintensity and T2 hypointensity. Computed tomography revealed extracranial extension of the mass through the occipital bone. Meningeal melanoma is more likely to develop from leptomeninges (pia, arachnoid) than the pachymeninges (dura).5 According to Hayward, a central nervous system (CNS) malignant melanoma should be diagnosed as primary if there is “no malignant tumour outside the CNS, involvement of the leptomeninges, intramedullary spinal lesions, hydrocephalus, tumour in the pituitary or pineal gland, or a single intracerebral lesion.”6 This patient’s cutaneous lesions developed after the dural mass was resected. No other CNS masses were identified. These findings are consistent with a dural-based primary lesion. 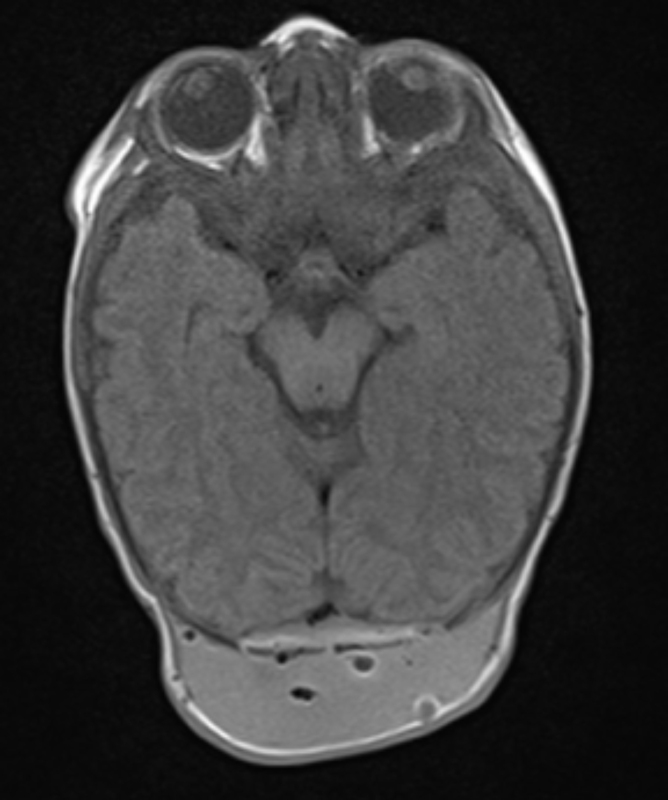 This case describes dural based intracranial and extracranial congenital malignant melanoma, which is is an exceptionally rare diagnosis. Brain MRI of the tumor demonstrated the typical melanotic pattern of predominantly T1 hyperintensity and T2 hypointensity. Computed tomography revealed cortical irregularity and posterior scalp swelling. Neuroimaging with CT and MR was essential in guiding management and monitoring for recurrence of this condition. Buetow P, Smirniotopoulos J, Done S. Congenital brain tumors: A review of 45 cases. Am J Neuroradiol. 1990; 11:793-799. Sugimoto M, Kurishima C, Masutani S, et al. 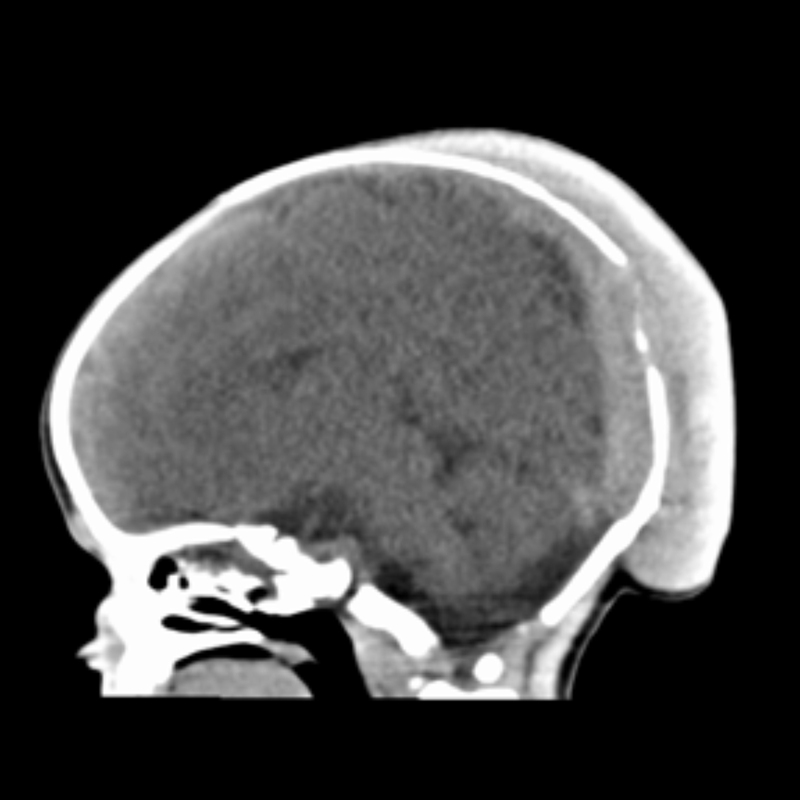 Congenital brain tumor within the first 2 months of life. Pediatr and Neonatol. 2015; 56:369-375. Scalvenzi M, Palmisano F, Cacciapuoti S, et al. Giant congenital melanocytic naevus with proliferative nodules mimicking congenital malignant melanoma: A case report and review of the literature of congenital melanoma. Case Rep Derm Med. 2013;2013: Article ID 473635, 6 pages. Ohsie S, Sarantopoulos G, Cochran A, et al. Immunohistochemical characteristics of melanoma. J Cutan Path. 2008; 35:433-444. Escott E. A variety of appearances of malignant melanoma in the head: a review. Radiographics. 2001; 21:625-639. Hayward R. Malignant melanoma and the central nervous system. J Neuro Neurosurg Psychiatry.1976; 39:526-530. Isiklar I, Leeds N, Fuller G, et al. Intracranial metastatic melanoma: correlation between MR imaging characteristics and melanin content. Am J Roentgenol. 1995; 165:1503-1512. Smith A, Horkanyne-Szakaly I, Schroeder J. From the radiologic pathology archives: Mass lesions of the dura: beyond meningioma—radiologic-pathologic correlation. Radiographics. 2014;34: 295-312. Sylvestre D, Brown C, Schilling A. Congenital malignant melanoma of the dura. Appl Radiol. 2018;47(10):21-22. Prepared by Ms. Sylvestre while a third-year Medical Student at Mercer University School of Medicine, Savannah, GA; and Dr. Brown while a PGY-4 Diagnostic Radiology Resident, and Dr. Schilling while Section Chief of Neuroradiology, at Memorial Health University Medical Center, Savannah, GA.